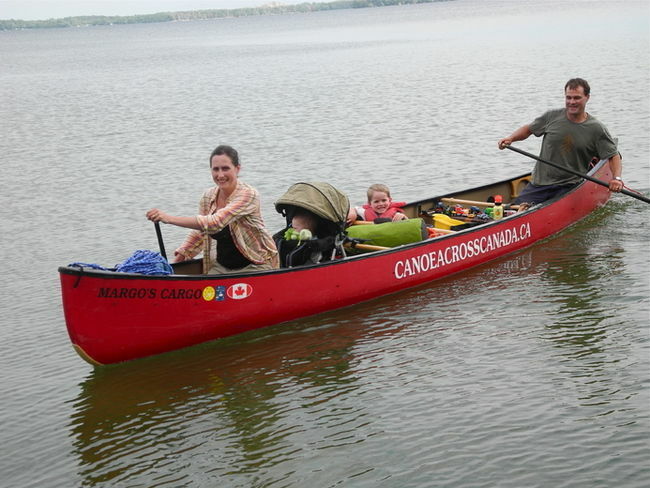 ORILLIA – When newlyweds Geoff and Pam MacDonald began canoeing across Canada six summers ago, their cargo looked very different. They didn’t bring snack-size Smarties, they didn’t bring Hot Wheels, they didn’t bring plastic beach toys and they most definitely didn’t bring two little boys. When the couple initially set out from Victoria, B.C., March 22, 2007, they thought they could make it to Newfoundland in three years. The MacDonalds and their Alaskan malamute, Taq — all of whom live just outside of downtown Calgary — will be wrapping up their close to 10,000-kilometre voyage in the 20-foot-long Esquif Mirmachi canoe this August in Quebec City, where the St. Lawrence River opens up into the Gulf of St. Lawrence. It took Geoff, a geologist, and Pam, 37, an operations analyst, a year and a half to make it to the Continental Divide. “It was uphill through B.C. the whole way. We paddled up the Fraser (River) 500 kilometres against the current,” Pam said. And they portaged or paddled the entire time, including over the three mountain passes before they hit Banff. “Once we got over, it was all downhill to Lake Winnipeg,” Geoff said. While the couple took the summer of 2009 off to be with Geoff’s mother, who had just been diagnosed with cancer, they were back at it in 2010, but with a baby in tow. Trying to get across Manitoba was the most mentally taxing part of the trip. The first time they attempted to make the voyage, they had to turn back because Cedar Lake, just west of Lake Winnipeg, had flooded. “We went back there last year when it wasn’t flooded and tried to do it again. We got out on a delta just before Lake Winnipeg and we were stuck for a week with the wind,” Geoff said. While they initially tried to take the Saskatchewan River to Lake Winnipeg and then travel south to Kenora, Ont., they ended up rerouting and taking the Assiniboine River across instead. “A lot of people ask us where our favourite places are, but there’s a real geographical beauty in every region that we go through,” said Pam, who has a new appreciation for the outdoors after experiencing it with her sons. On Monday, five-month-old Rane saw two ducks fly off the water. “It’s the first time he’s ever really reacted to anything in nature. He giggled and stared,” Geoff said. The family, which is about 300 kilometres through the final 1,500-kilometre leg of their journey, paddled into the Port of Orillia Tuesday evening and spent the night at Geoff’s parents’ house in Warminster. They departed Wednesday morning for Gamebridge through Lake Simcoe.